Mars Science Laboratory Curiosity team members celebrate the landing of Curiosity rover on the surface of Mars at NASA's Jet Propulsion Laboratory in Pasadena, Calif., Sunday, August 5, 2012. 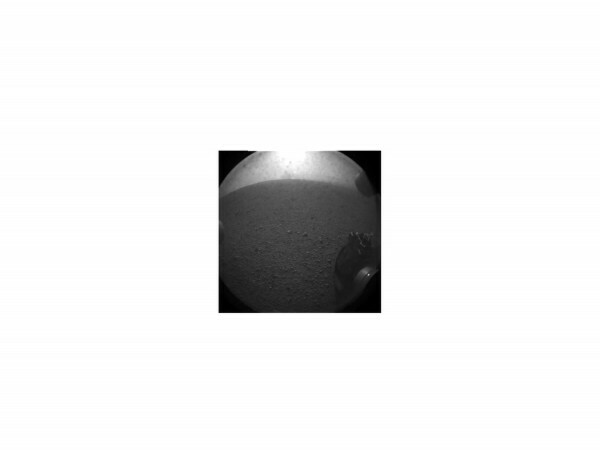 In this black and white photo released by NASA's JPL-Caltech, Curiosity rover snaps picture of its shadow. This is the first image taken by NASA's Curiosity rover, which landed on Mars the evening of Aug. 5 PDT . 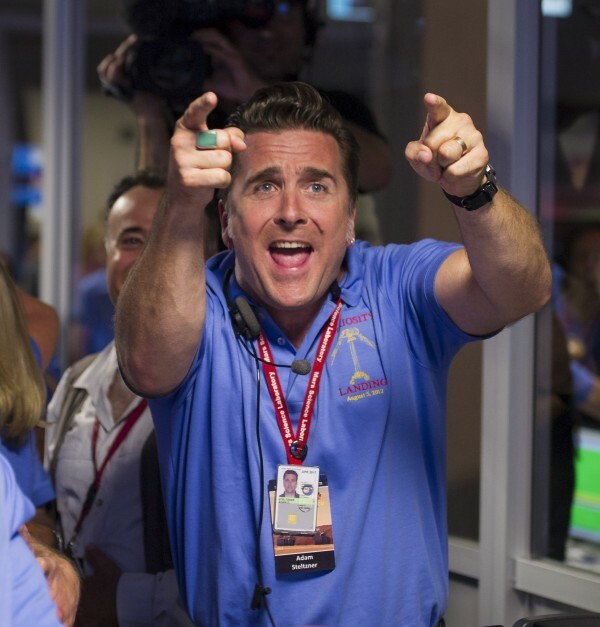 Mars Science Laboratory Engineer Adam Steltzner reacts after the Curiosity rover successfully landed on Mars and its first images start coming in to the Jet Propulsion Laboratory. PASADENA, Calif. — In a show of technological wizardry, the robotic explorer Curiosity blazed through the pink skies of Mars, steering itself to a gentle landing inside a giant crater for the most ambitious dig yet into the red planet’s past. “We landed in a nice flat spot. Beautiful, really beautiful,” said engineer Adam Steltzner, who led the team that devised the tricky landing routine. It was NASA’s seventh landing on Earth’s neighbor; many other attempts by the U.S. and other countries to zip past, circle or set down on Mars have gone awry. The arrival was an engineering tour de force, debuting never-before-tried acrobatics packed into “seven minutes of terror” as Curiosity sliced through the Martian atmosphere at 13,000 mph. 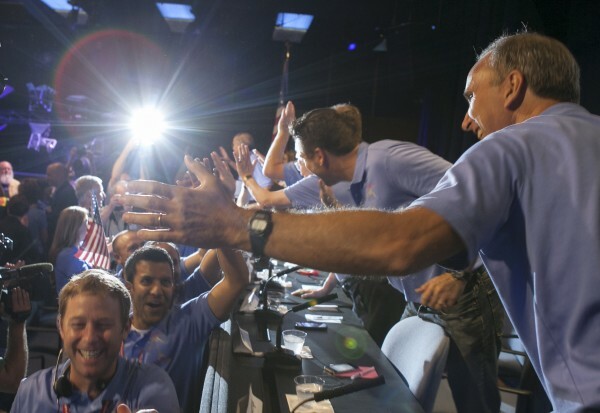 Celebrations by the mission team were so joyous over the next hour that JPL Director Charles Elachi had to plead for calm in order to hold a post-landing press conference. He compared the team to athletic teams that participate in the Olympics. “This team came back with the gold,” he said. “The wheels of Curiosity have begun to blaze the trail for human footprints on Mars,” said NASA chief Charles Bolden. Over the next two years, Curiosity will drive over to a mountain rising from the crater floor, poke into rocks and scoop up rust-tinted soil to see if the region ever had the right environment for microscopic organisms to thrive. It’s the latest chapter in the long-running quest to find out whether primitive life arose early in the planet’s history. The landing site near Mars’ equator was picked because there are signs of past water everywhere, meeting one of the requirements for life as we know it. Inside Gale Crater is a 3-mile-high mountain, and images from space show the base appears rich in minerals that formed in the presence of water. Previous trips to Mars have uncovered ice near the Martian north pole and evidence that water once flowed when the planet was wetter and toastier unlike today’s harsh, frigid desert environment. Curiosity’s goal: to scour for basic ingredients essential for life including carbon, nitrogen, phosphorous, sulfur and oxygen. It’s not equipped to search for living or fossil microorganisms. To get a definitive answer, a future mission needs to fly Martian rocks and soil back to Earth to be examined by powerful laboratories. Despite Mars’ reputation as a spacecraft graveyard, humans continue their love affair with the planet, lobbing spacecraft in search of clues about its early history. Out of more than three dozen attempts — flybys, orbiters and landings — by the U.S., Soviet Union, Europe and Japan since the 1960s, more than half have ended disastrously.